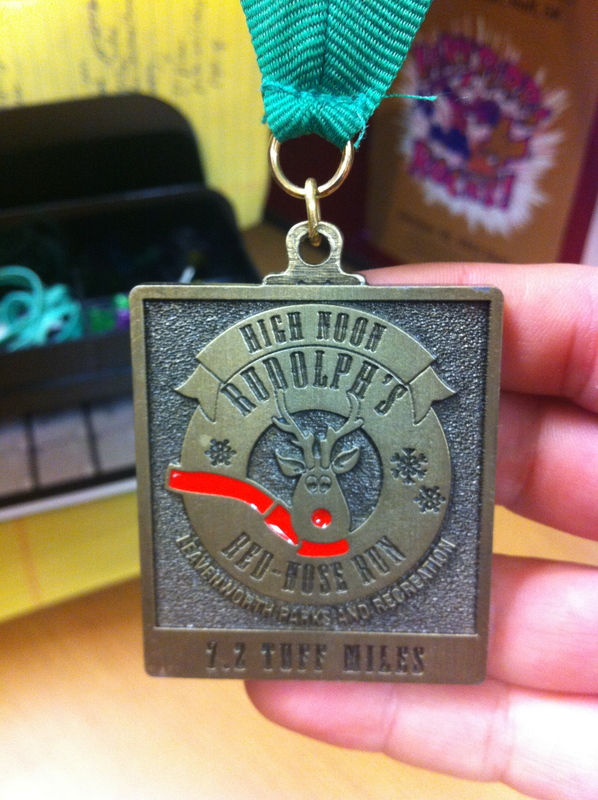 On the 7th day of running, the High Noon Red-Nosed Rudolph Run gave to me: 7.2 “Tuff Miles” to think about why I shouldn’t have eaten bacon for breakfast. I love me some bacon – specifically nitrate-free, apple-wood smoked awesomeness form Trader Joe’s. But although bacon is a great source of protein, can be healthy if you cut out the processed additives, and is a traditional breakfast delight for your taste buds, it is NOT a race day food. Beer, however, is still a great post-race food. “So, are there obstacles or tricky parts to it, or just hills?” I asked fellow racer Bob Wooten, Leavenworth resident and your friendly neighborhood running man. Yeah, “just hills.” I am Hill Master. I love races with hills because it’s the only time I actually have a chance competitively because my thunder thighs maybe not be speedy, but they are hearty, and they love to devour a giant hill with a hint of a burning. In addition to the Hill Advantage, I also had the Late Race Start Time Advantage, which is what I call any race that starts at 9am or later. I actually have time to sleep, eat, hydrate, and regain consciousness. The race starts at noon at the High Noon Saloon and is followed by a free pasta lunch with the opportunity to try the saloon’s own home-brewed beer. They are best known for their Annie’s Amber Ale (either because of tastiness of the beer or the tastiness of the female model on the cans, I’m not quite sure). I highly recommend washing down pasta and the nauseous leftover taste of bacon with a Tonganoxie Honey Wheat or Rudolph Seasonal pint. In addition to the the above mentioned advantages, I also had the Unseasonably Warm for Winter Kansas Weather Advantage. By noon, it was a humid, humid 60 degrees. So shorts and a tech t-shirt for me! Apparently the last few years the director of the race has been praying to make us run through this already torturous course with the added bonus of lots of snow, plus to give us the race name red noses. Not today! Today it was cloudy, warm, humid, with a very high chance of bacon upchuck. My usual pre-race breakfast is a protein smoothie with almond milk, berries, a few veggies, and chia seeds. Since we didn’t have to be ready to run until noon, my fiancee Jason and I slept in. We got up around 10am. We finally made breakfast around 10:15am, and then had to leave by 10:30ish. I made a hearty breakfast of spinach and tomatoes with scrambled eggs and put a fried egg and bacon on a whole wheat English muffin to make a my own Egg McMuffin. Protein, carbs, fiber – it was pretty tasty. But notice my usual breakfast is bland and liquid – easy to digest and friendly to the stomach. This breakfast was a solid meal of lots of protein and the added treat of bacon grease. Plus, I didn’t have nearly enough time to digest it all before the race. But even if I had eaten a bit earlier, that bacon grease still would have sat in my stomach. So, we began the race, and I felt ok the first mile. Right away there was a hill and a girl trying to pass me on it, so I sped up a bit and held her off. Ha, I’ll use her as my goal to keep ahead of during the race. But as the race went, my strategy soon turned from holding that girl off to holding back that wanting to throw up bacon all over the hills feeling. Jason passed me around mile 4, at the turn around, and I knew I had to at least keep up with him. He, too, was feeling the joys of bacon while running. Well, that girl who I’d held off took had taken off and wasn’t even in sight anymore. Jason had just passed me right at the water station around mile 4 at the turnaround. And while I was grabbing a quick drink, I heard one of the volunteers offer water to a runner behind me and her female voice saying thanks. No! Only if it’s a female clearly outside my age group! She passed me around mile 5. She was wearing a pink Gobbler Grind shirt from the half marathon we had done a few weeks before, so I knew she was a serious runner. She also looked young, but not too young. She was probably in her 30s, but when running, women look younger because we rarely have on makeup and have our hair up, in addition to runners are just a young-looking fit people. Could I chance it? Luckily we hit a giant hill – all the hills in this race are big, but this one was a particularly steep and intimidating looking. My Hill Master pride kicked in, and little by little, I passed her on the hill and let it all go on the downhill in hot pursuit of Jason. Meanwhile my stomach was in hot, nauseous pursuit to be free of the bacon grease. The humidity wasn’t helping, Jason being ahead of me wasn’t helping, the girl behind me of unknown age group wasn’t helping, and now I was having an imaginary conversation with my stomach. Clearly I was in the delusional running zone. And according to my Garmin, I was at mile 6.5 and I was STILL going uphill. The crest of the hill happened at 6.75 miles, and the finish was spread out down below – a welcome sight for delusional eyes and nauseous stomachs. I kicked it in, but then had to reel it back. Ahhh! Jenny! Why?! The horror, the horror! I’m drowning in bacon grease! Jason won our race battle – but I won the battle with my stomach of not upchucking. I crossed the finish line, breathing hard, swallowing harder, fighting to regain normalcy. I looked back and the girl in pink was a spec. Victory was perhaps mine, depending on who finished ahead of me. Mostly though I was just glad to finish with all of what I started with. 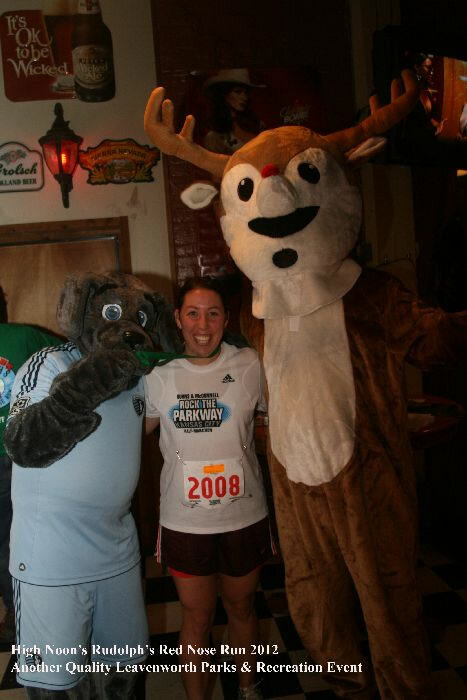 Receiving my medal with Blue from KC Sporting and Rudolph himself! I hope Rudolph learns to eat a healthy breakfast before delivering presents with Santa! The post-race lunch and beer was a relief. Bland pasta, salad, and a honey wheat beer did a great job of quelling my stomach and absorbing the last of the dreaded bacon grease. Awards went out and I did score first place for my age group 25-29. The second place woman was less than 2 minutes behind me, someone other than the girl in pink, so I was glad I didn’t give up on the race and fought to keep going. Plus, the medal picture (on the right) is one of my favorites. Check it out, and remember, kids, to heed this cautionary tale of the dreaded bacon for breakfast on race day. A proud reminder to never give up on a race but to also never eat heavy foods before a race! Posted on February 18, 2013, in Food, Humor, Lessons, Races, Recommendations, Running, Uncategorized and tagged 7.2 Tuff Miles, bacon, Hills, Humor, Leavenworth, Red-Nosed Rudolph Run, Running. Bookmark the permalink. Leave a comment.